Heat 3 tsp of oil in a skillet or a stir fry pan. Add cabbage and stir fry cabbage for about 2 minutes or until tender. 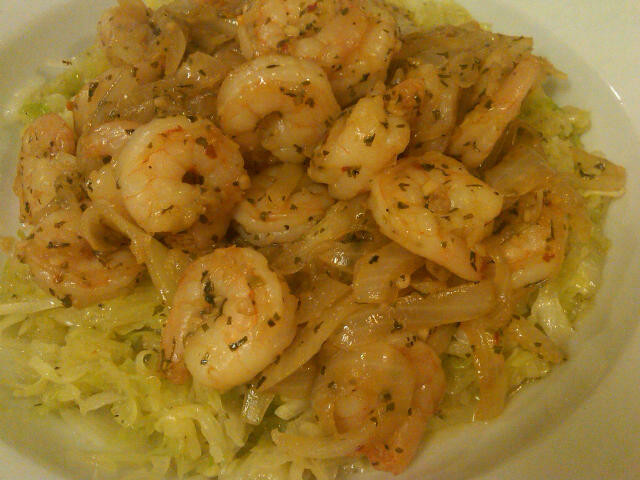 Remove cabbage and keep warmed; sprinkle with salt and pepper, to taste. In the same pan, add 3 tsp of oil and stir fry onions and garlic until tender. Add the shrimp, water and soy sauce; cook until shrimp turns pink. Sprinkle with cilantro and red pepper flakes, stir.